To close out crossride week, we have the ultimate evolution of Vermillion. A Lord crossride, Blood is the third unit to include the limit break five skill, and its a big one. As with the other crossrides, he sports an 11k body that goes up to 13k if Vermillion not-The-Blood is in soul. For the same cost as Vermillion, a counterblast of three, Blood gains 5k and a critical, and battles the opponent’s entire front. This is where Blood is so much more lethal than Vermillion. Adding that critical all but eliminates the opponent’s thoughts of just taking the hit. 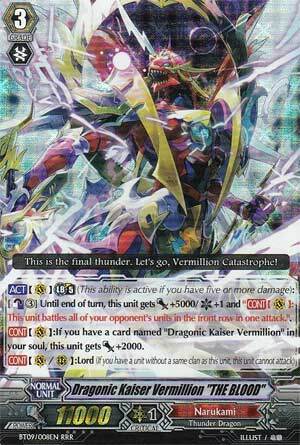 The reason Vermillion was so successful is that, no matter what, he was costing the opponent at least two cards; either the cards he was attacking, or the ones the opponent was guarding with. Many players, including myself, would often go for the conservative option and not guard, which, barring a double crit, would place you in the best position for a recovery next turn. But with the Blood, you can’t just take it, unless you are only at one or two damage, since a single critical would mean three damage and potentially the game. This means the opponent will have to lose as many as four or even five cards just to ensure survival. That’s a big deal. The Blood is a tremendous step up from Vermillion, and will definitely be a factor in the upcoming metagame. Rating: 5/5 – The added critical makes all the difference. Stupidly popular (for god knows why, I've seen it more often than I've seen The End) we have Dragonic Kaiser Vermillion "THE BLOOD" (Look at those CAPITAL LETTERS). On 5 damage, you get to CB3, and he attacks the opponent's front row, gains 5k, and a Critical. 5k...pretty negligible since power gaining isn't really a big deal when Perfect Guards are a thing. Critical...yeah, so this is the bit where I tell people Critical at a point where the opponent has to guard the Vanguard anyway never works. Counterblast 3...that's exactly the same cost as the original Vermillion? So what makes him different in the grand scheme of things? Both involve dropping a PG to protect the Vanguard as your front row gets blown up...oh, THE BLOOD has to wait on 5 damage. That makes things WORSE. You can't really argue that the extra Critical can recover you if you get sacked because that's only relevant on 4 damage while they're on 3. In this case, the opponent will be on 4 most of the time while you're on 5. So they'd STILL have to guard the Vanguard normally because Critical Triggers are a thing. I've actually fought this deck many times, and most of the time, as long as I'm running a deck with finishers that are actually GOOD (like, oh I don't know, THE END MAYBE) I've hardly ever lost. Partially because I can manage 5 damage easier than 4 (although I should point out the longer you attack rear-guards to delay him, the more advantage THE BLOOD user will gain owing to not needing to guard as heavily Late Game and due to the saturation of attackers in a given deck), but also mostly because users tend to Crossride him before they use the original Vermillion's skill first. So I have more time to wrack up my own advantage and brace myself for the explosion. Even if I use THE BLOOD myself, I can't justify adding damage exploders just because the original Vermillion exists. Use him for the 13k defense, but his skill's a dud. He's proof you should always look at a card in context before you use it.